One of the biggest virtues of online sports streaming is the flexibility to tune into the action anytime, anyplace, and anywhere. And the premium video content evolves, the flexible it becomes, both in terms of geographical location and viewing medium. As a result of this, sports fans are indeed becoming more international, and more mobile, than ever before. As a recent example, take the devout fans of major English Premier League clubs. These football mad fanatics can now watch their favorite teams play from a packed bar in most cities around the globe. And a recent study suggests that fans of Arsenal, Chelsea, and Manchester are estimated to exceed the 210m mark – spread across the world. Of course, international demand presents fresh opportunities for federations and sporting clubs to build a robust menu of rights packages and content that sparks an interest with local fans. To remain buoyant in this new climate, content must be tailored to local requirements with appropriate subtitling and audio, coupled with a geo-specific advertising and payment infrastructure. At present, fanbases are diversifying. As sports goes far beyond traditional demographics, they’re becoming more accessible, inclusive and appealing to international fans, women, and families than in previous years. It’s somewhat of a revolution. A recent survey by Performance Communications and behavioral insights agency Canvas8 discovered that 90% of people feel that anyone can be a sports fan. What’s more, 85% say that it’s important for sports to grow thriving fanbases. In addition to fanbases moving away from their traditional, somewhat segregated demographics, they are also getting increasingly mobile. With the significant rise of mobile devices and the adoption of mobile devices, being a sports fan is no longer a part-time venture. These days, smartphones, tablets, and 4G mean that being a sports fan is a 24/7, round the clock experience. A whopping two-thirds of ESPN’s current audience is exclusively mobile. The same report says that TV and the web are the primary platforms for consuming that content. 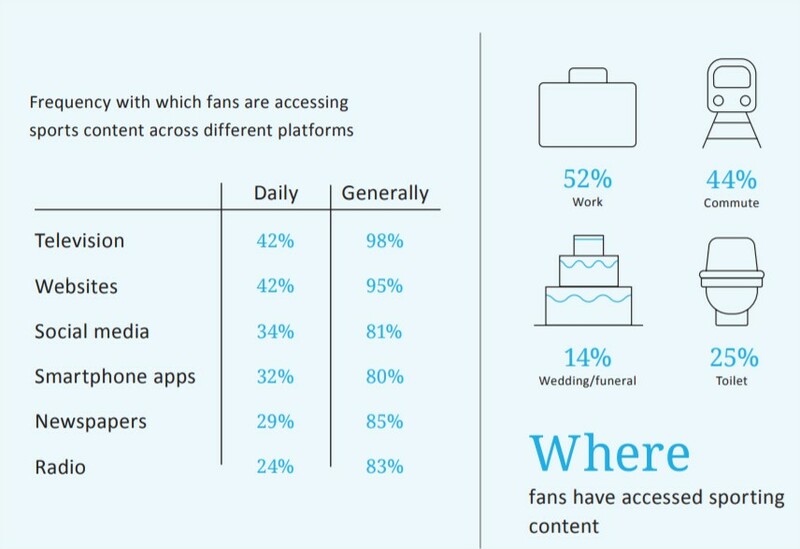 73% of sports fanatics state it’s important to access sporting content whenever they want, and 83% say viewing out-of-season content is also important. With the demographic and geographic goalposts shifting in a big way, and the influence of mobile becoming all the more potent, the world of sports entertainment is heating up, offering a host opportunities to savvy content providers. So far, this year there’s one thing we can say for sure: there’s everything to play for.